Jim Eden at Worth Avenue Yachts tells me that he's jointly listed the 41.5m motor yacht Dreamer along with his colleague Simon Gibson, Michael White and Peter Thompson at Ocean Independence and Michael DiCondia at Hargrave. Built by Hargrave in 2010, Dreamer can accommodate as many as 13 guests in five staterooms while twin 1825hp Caterpillar engines give her a range of 3,300 nautical miles. 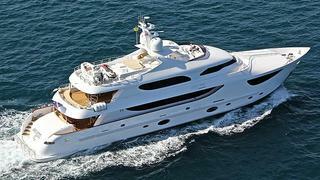 Located in the Bahamas, Dreamer is asking $16,995,000.